This page provides an overview of the architecture of the Google Ad Manager API and describes general concepts and terms in Ad Manager. An Order object holds general information about the order such as the currency or salesperson, and contains one or more LineItem instances. In code, each LineItem holds the ID of its containing Order, rather than the Order holding a list of LineItem objects. A LineItem object describes a set of requirements for an ad to show, including how and when the ads should be shown, the sizes of the creatives it should show and the order in which to show them (in order, weighted, or according to their performance), the priority of these ads, and many properties describing the cost structure. A LineItem has one InventoryTargeting object that describes which AdUnit and Placement objects it can target, and optional additional Targeting subclass objects that represent geographical, custom, or other criteria. A LineItemCreativeAssociation (often called a LICA) links one LineItem to one Creative. Line items can be linked to more than one creative, and depending on your account type, you might be able to link a creative to more than one line item. When you create a LineItemCreativeAssociation, Ad Manager first checks whether both the creative and the line item are compatible; if the sizes differ, for instance, you'll get an error when you try to create or update the association. This object also lets you override some values in the associated LineItem, such as start/end dates, or size (if you have a creative that doesn't quite fit the size specified by the line item, but you are willing to let Ad Manager adjust the size of the creative to fit the ad unit on the fly). LICAs are not exposed in the Ad Manager user interface; they are an API convention. A Creative represents the actual ad. If the ad is hosted by Ad Manager, this object holds the actual image bytes, flash files, or custom HTML tags stored on Ad Manager's servers; if the creative is hosted on a third-party site, the creative is a URL or HTML snippet that makes the request from the third-party server. 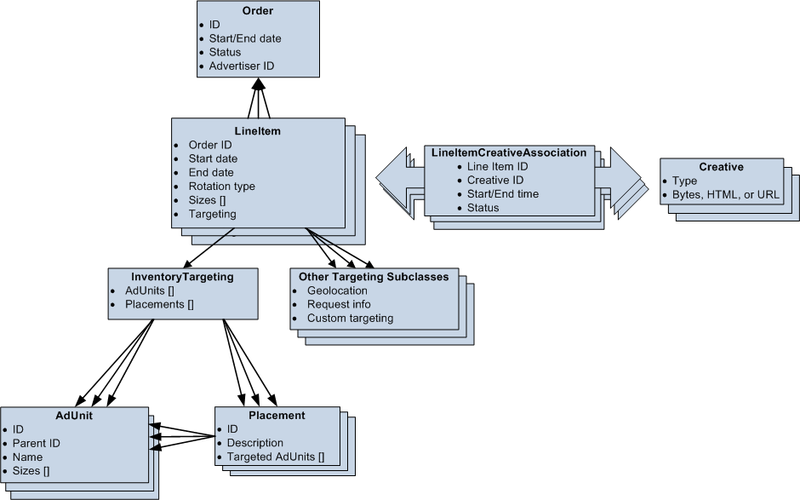 The InventoryTargeting object lists which ad units are associated with a specific LineItem. You can specify additional, optional targeting criteria using additional instances of an appropriate subclass of Targeting. A Placement object is a collection of one or more AdUnit objects. An AdUnit represents an ad location on one or more pages. An AdUnit can be a target of either a LineItem's InventoryTargeting object or a Placement object. An AdUnit object includes a size, an ID, and a unique name. The ID is used to identify other AdUnit objects within the API; the name is used as a unique identifier in the HTML tags to identify a specific AdUnit object, and is sent back to Ad Manager as part of the page request.